That question has been consuming Dr. Lisa Bliss for more than a year. To understand her answer you have to know that Lisa has built a career in the science of “ultrasports”—road races that take place over distances that boggle the mind. In addition to leading the medical teams for some of the toughest competitions in the world, Lisa has run thousands and thousands of miles in races all across the world. You might not know it to look at her small frame, but Lisa is a powerful mover and shaker. So as her question morphed into “What would you do if you thought you were very likely to fail but stood the smallest chance that you wouldn’t?” the answer was clear. 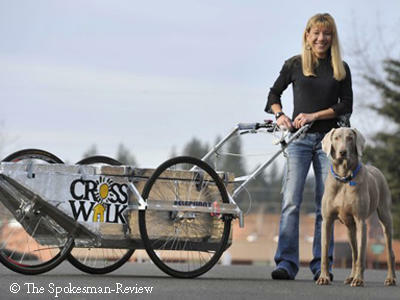 On July 25, 2011, Lisa plans to attempt to be the first woman and second person ever to cross Death Valley solo, unsupported and self-contained—meaning she will run alone, without outside help of any kind, carrying all her food water and supplies in a 230-lb cart custom designed for her by Glen Copus of Spokane’s Elephant Bikes. The journey from the Badwater Basin to the summit of Mt. Whitney will take her from the lowest point in the contiguous U.S. to the highest—an altitude change of more than 14,000 feet. Lisa will cross more than 135 miles of asphalt followed by an 11-mile climb to the summit of the mountain for a total of 146 miles in blistering desert temperatures up to 130 degrees. Why would Lisa want to do such a thing? To help the homeless youth at Crosswalk. ​“I believe with all my heart and mind and body and soul that there is no failure in trying, for as long as we keep trying.” That’s something she wants to prove to the youth at Crosswalk teen shelter—both by making this attempt and also by attempting to raise $10,000 to fund the GED and college scholarship programs at the shelter. All the money raised by her endeavor will give homeless youth the opportunity to try to overcome their circumstances through education. The funds will pay for GED fees, textbooks and other related expenses. Lisa wants to show the youth that when you choose to keep moving toward a glimmer of hope, focusing on any minute possibility of success—rather than focusing on the obstacles in the way—you succeed simply in the trying.